Following on from the sell out success of their first 2 monumental events, Infinity now deliver another stellar line up, set to be their biggest yet! Welcoming a Grammy nominee to Nottingham, are you ready for some Moor? 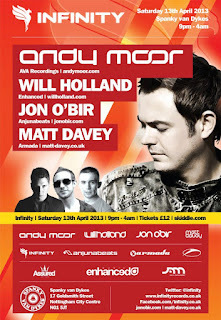 Andy Moor - Grammy-award nominated, Andy has established a distinct, edgy and creative sound that is completely his own. Highly ranked in the DJ Mag Top 100 for the past 6 years, he was nominated for the DJ Awards in 2009, won ‘Best Dance Record’ at the International Dance Music Awards in 2006, and ‘Best Trance Producer’ and ‘Best Trance Track’ in 2004. A highlight of Andy’s illustrious career was his nomination in the “Best Remixed Recording” category at the 2008 Grammy Awards for his remix of Delerium’s ‘Angelicus’. Owner of the highly respected AVA Records, host of the ‘Moor Music’ podcast, producer and remixer to the stars (past remixes and collaborations have included Tiësto, Above & Beyond, Britney Spears, Avril Lavigne, Paul Oakenfold and others). For fifteen years, Andy has been at the forefront of a rapidly evolving music scene, pioneering new sounds and techniques whilst consistently releasing the finest in progressive and trance. Jon O'Bir - Most modern day DJs are booked to play a certain style but this isn’t the case with Jon O’Bir, who is well known for his versatility behind the decks. Jon has spent many years warming up large crowds for headline acts, playing last sets in Amnesia, Ibiza. More recently he joined Above & Beyond on their Group Therapy Tour and was also invited to join Paul van Dyk on his Evolution Tour. Having spent the past few months crafting away in the studio, Jon’s latest single is set to be revealed by Infinity in the coming months, showing a new face for the label whilst carrying forward his ever evolving signature sound. Matt Davey – One of the hottest producers around at the moment, his latest A State of Trance release “Neutrino” has been one of the most supported tracks of 2013 so far! 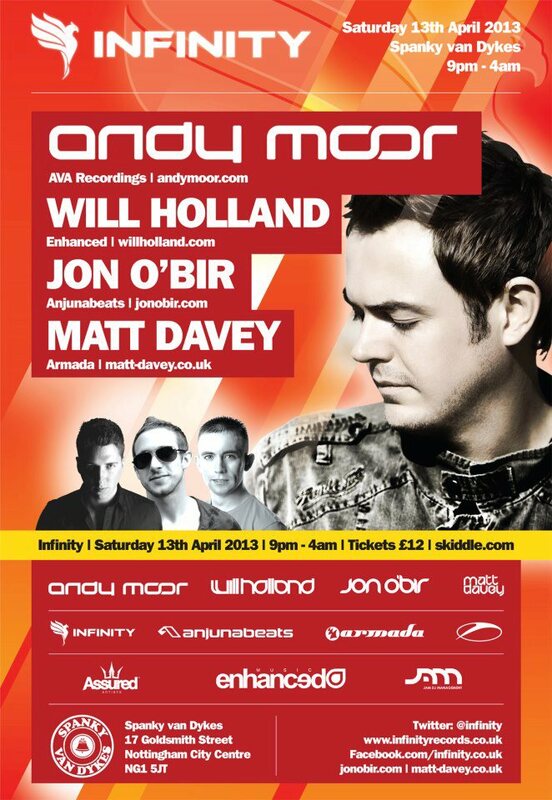 The week before our April Infinity event Matt joins the famous ASOT 600 Expedition Tour in Den Bosch, which is set to be the biggest event of 2013! The world’s number 1 DJ Armin van Buuren invited Matt in person to join him on his tour in 2013, a year set to be ground breaking for the Nottingham born talent. Venue - Spanky van Dykes, 17 Goldsmith, Nottingham City Centre, NG1 5JT.